I bet some of you were beginning to wonder if there was no end to the wonders in the 1959 Family Comics section. But today is our last strip, and I saved a pretty good one for last. 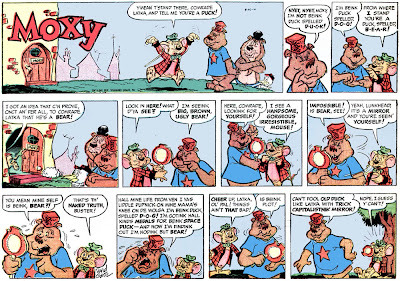 Moxy is a funny animal strip by David Gantz. What's neat about it is that there are political undertones in it a la Pogo. One of the stars of the ensemble is a Russian bear named Comrade Latka, complete with red star on his shirt. Neat stuff. Thanks you for sharing these. I was a fun ride. You had something similar about a year ago (on April first) about The Westover Yankee Flyer. That had a lot of unknowns as well and included Boltinoff. Could you as a coda to this series go back to that and maybe show us a bit more from it? Yeah, I real ought to go back to that Yankee Flyer. I'll add that to my ever-lengthening to-do list! 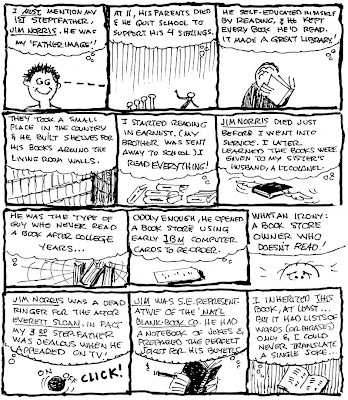 Layton Prince was a father-and-son detective strip by Gaeton Williams. I know nothing about Williams, but I doubt it's a pen-name since you rarely see pseudonyms signed with such flourish. 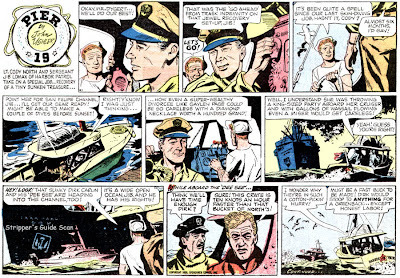 One thing we can say for Williams is that he, like so many cartoonists of the era, was under the spell of Alex Raymond. Well, except for that one panel with a George Wunder swipe. 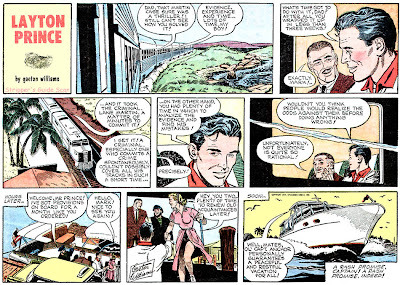 This strip has a pretty good, sophisticated plot, leaving me wondering if Williams might have swiped a little more from Rip Kirby than artwork. If not it's a shame we never heard any more from Gaeton Williams -- he was definitely ready for the big show. The signature bears an uncanny resemblance to that of William Overgard. Although his work on Steve Roper was a lot looser than this, he was an amazingly versatile artist who could have pulled this off. "Layton Prince" -- "Latent Prints". That's a good one. Thanks for sharing all these great comic strips. Dang, I never made the connection. That IS a pretty good one. I received a private email from Alberto Becattini in which he says with great confidence that this strip is by Bill Lignante. I can definitely see his point, but I'm still just a bit skeptical. That flowery signature keeps me from wholeheartedly going along with Alberto. 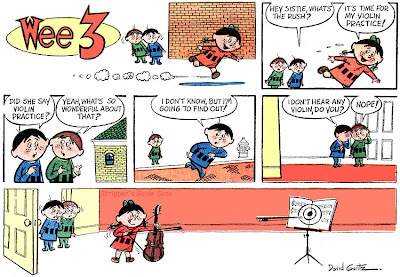 Wee 3 is a kid strip sporting delightful animation-style art by David Gantz. Gantz went on to create one of the last features ever to be introduced by the New York Herald-Tribune Syndicate, Dudley D. The strip outlasted the syndicate by a few years but never made much of a splash. After a very long fallow period, Gantz returned with Don Q (what's with the fascination for initials, David?) in 1976. Don Q is notable for the fact that it was syndicated by the New York Times. In the mid-70s the Times got the comic strip syndication bug and tried distributing a small budget of strips, most of them quite good. The Times seemed palpably embarrassed by their own new business and the comic strip syndication never really took off despite the quality of the material. New York Times syndicated daily strips!? Wow, you learn something every day. Did Times ever actually ran daily strips at one point in their existance? From my understanding, there was only one: "Roosevelt Bears" from 1906. I have the original for 8/22. With color guide. No, the NYT never did run a daily strip that I've found. And some might quibble that the Roosevelt Bears was more of an illustrated story page. As I understand it the Times now does run strips occasionally, hi-falutin' types like those done by Peter Kuiper. The Times, like most newspapers with national distribution, has the problem that they cannot use any syndicated strips because of the territory restrictions placed on them by the syndicates. So even if they did decide to do a huge about-face and add a comics page, it would have to be all material created in-house or acquired through special contract agreements. Jeffrey Lindenblatt just emailed me privately to point out that the Times could run daily comics in the locally distributed sections of the paper. The national edition lacks several sections that are included in the NYC edition. Good point, Jeff! 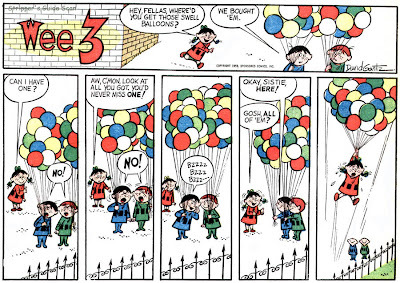 Wee Three was also the cover feature of Famous Funnies #218 in 1955. So he probably had been trying to sell it for a long time before Sponsored Comics came along. In the same issue Gantz also draws a Dennis the Menace knock-off called Melvin the Monster, years before Stan Lee called his Dennis take-off that. 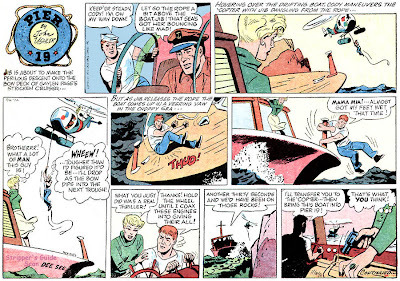 Here's Pier 19, a seagoing adventure strip by John Ushler. 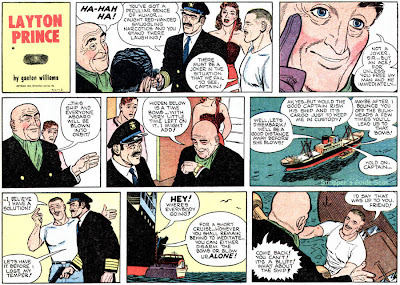 Ushler was primarily a comic book artist in the 50s, he had a workmanlike but not particularly inspired style. He found his niche when he went to Disney in the early 60s. In the newspaper realm he was responsible for a few of the Walt Disney's Treasury of Classic Tales stories and drew the Uncle Remus strip through its waning years in the 60s and 70s. He also did five of the annual Disney/King Features Christmas strips. Here's a strip by Ed and Irma Nofziger; Ed did a lot of syndicated work and his best features always starred animals. Animal Antics and Animalogic, both panel cartoons, were his two most successful. Mildred, sort of a Little Iodine set in a zoo, was another of the Family Comics features that was advertised in E&P in 1960 as a standalone. Nofziger was a very active cartoonist as well - or they were, I never knew it was a couple. This strip is nothing special and neither were there cartoons. But it is interesting to note they started the trend to do a different title panel every week about thirty years before Mutts. Ed Nofziger was also involved in animation. He did some stories for "Mr. Magoo" and 1960s "Popeye" cartoons. Ger, you're forgetting those great title panels that the Hearst features used in the teens and twenties before the days of toppers. Some, especially those on Bringing Up father, were just gorgeous.